Covers on the topic on why it is more preferred and selected as the main treatment option. Waste Water Evaporators can be used to treat industrial waste water generated in small amounts coming from process plants and it is often looked upon as a viable alternative that contributes towards significant cost reduction and savings. 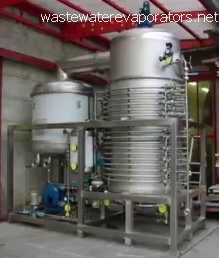 Considering all aspects related to its operation, overall use of the system is generally much better than operating conventional treatment plants and unlike those large scale systems, which require constant attention and management skills, waste water evaporator is very much easier to operate and maintain, plus it offers more benefit in the long run. Waste water evaporator unit actually minimizes the hassle that comes with handling of waste discharge and apart from that, it is also considered to be environmentally friendly. What makes it advantageous compared to the age old treatment method is that you don’t really have to deal with complex control parameters and overall it is more efficient to get rid and treat the water. Basically what it does is that, waste waters are actually heated to certain degree to boil off the water and other volatile compounds and then what is left is actually the solid waste which will remain collected as the end material. This also improves on the handling of solid discharge because the leftover mass can be easily transported and disposed off easily. Waste Water Evaporators is intended to provide access to information related to evaporation technology as an alternative waste treatment option. The main purpose of this website is to introduce overall concept and application on how the whole system can be utilized as a cost saving method. Hopefully, all data gathered here is helpful towards the benefit of engineers pursuing this field.